False colours, chapter four, begins with Jan Jansen arriving at his mother's home, flying the pirate's flag to say goodbye and take his leave, perhaps for a long time; and to kidnap his son. Here's a thought; whilst you can read these unedited editions of A Family Affair for free, once you find you're enjoying the plot, why not lash out and spend 130c, yes, that's right, for the fully edited ebook except that Amazon fiddles the price unannounced? Have you a Kindle, or smartphone? This page was last updated by Bernard Preston on 15th December, 2018. 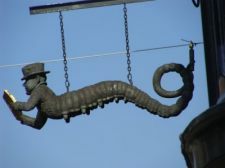 Some months later, at one of their many pity parties, Janet and Ouma bemoaned the fact that coincidence also had also given Screwtape the perfect opportunity to put the knife in to the hilt. When the sordid details did finally all come out in the wash, she cried bitterly that Jan hadn’t been conniving with a mere minion. He was making a tryst with the very Devil himself. It all began several weeks after Janet’s first visit to Ouma’s home. She phoned, wondering if she dared to ask. They had been several times to Ouma’s home and it was quite clear that KJ loved being with his grandmother. And she with him. 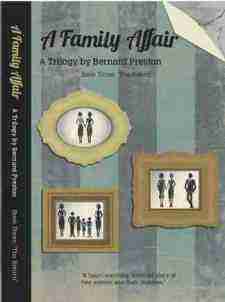 A family affair is a trilogy by Bernard Preston. False Colours is chapter four. False colours is pure tragedy; Jan Jansen kidnaps his son and they vanish for over twenty years before Ouma and Janet are reunited with Klein Jan.
Jan Jansen’s plans couldn’t have fallen together more sweetly. Santie and Janet didn’t have the seniority or the experience to be at the indaba but he managed to convince his partners who would be doing the hard negotiating that it would be good experience for the young associates. Afterwards they realised that the events of that weekend started a chain of events rolling that would warp and twist many lives. No more than an hour after Janet dropped KJ at Ouma’s suburban home, the pirate arrived in false colours to say goodbye to Ouma, and fetch his son. He had carefully booked the flights to Australia to coincide with the conference. ‘Hello Jan! Yes, of course. What a nice surprise. You haven’t been here in an age. Wait a moment while I find the key,’ Ouma said. ‘I’m looking after KJ for a couple of days while Janet goes to some conference,’ she called over her shoulder, hunting in a drawer. The front door was standing open allowing a cool breeze to waft through the house at the end of the long hot day, locked only with a cyclone gate. KJ came toddling forwards, looking up at the strange man. Neither the small boy, nor the sightless old woman recognized the grim mask that Jan Jansen was wearing. A sighted Ouma would have immediately recognised it for a Jolly Roger. Klein Jan had seen The Fifth a few times, of course, but he was in reality a complete stranger. He dialed his own home number and handed Ouma the phone. It rang repeatedly, and meantime his eyes swept around the room. He walked swiftly around collecting the toddler’s toys and clothes, stuffing them back into a travel bag that Janet had brought. He picked up his son with a quick scoop of the arm, ignoring the cry of protest, took his mobile phone from his mother and, after giving her a too quick hug, vanished into the night with not another word. It did not take Interpol long to ascertain that Jan Jansen and Klein Jan Twycross arrived legitimately in Perth. The Fifth and Sixth were last seen leaving the terminal building and catching an airport bus for an unknown destination. There the trail went quite dead. No one realized that the man and a small boy who left on another flight two hours later, under a quite different guise, a Mr Jensen and his son, KJ were in fact the pirate and his son. Interpol were quite sure that they would turn up before long when Jansen tried to draw money or use his mobile phone. They were wrong. Back to chapter three Ouma Jansen. Bee under the Mitre a free story from Bernard Preston's first book. Hummus, a Chickpea Garbanzo bean dip ... Delic! eBooks for download ... what's it about? Bernard Preston's A Family Affair is his fourth novel. False colours is just one chapter in this tragedy. Bookworms should shop for it at Amazon; only a little over a dollar per copy.